Much is known about swallowing problems in terms of what might be done to fix or ameliorate things from a biomechanical or physiological perspective. We can also recite the mantra of evidence-based practice in our sleep. And yet decisions and interventions are still fraught with tension, anxiety and sometimes even conflict. 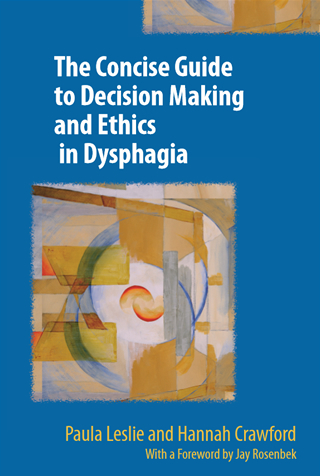 The Concise Guide to Decision Making and Ethics in Dysphagia explains why decision in dysphagia are difficult, what frameworks might help structure a more robust process, and links evidence to ethics to cases. The reader is guided through theoretical principles of risk analysis and bioethics to support real clinicians dealing with patients, their families, and carers on a day-to-day basis. A substantial list of references guides the reader to the evidence base and source material to support students and clinicians at all levels. Paula Leslie is a professor and director of the Doctor of Clinical Science in Medical Speech-Language Pathology Program at the University of Pittsburgh. She maintains full clinical licenses in the USA and UK where she is a professional advisor to the Royal College of Speech & Language Therapists in swallowing disorders. Her honours include the Honors of the Association Southwestern Pennsylvania Speech-Language-Hearing Association, the American Speech-Language Hearing Association DiCarlo Clinical Achievement Award, the Pennsylvania Speech-Language-Hearing Association Clinical Achievement Award, and Fellow of the Royal College of Speech & Language Therapists (UK). In December 2016 she completed the Interdisciplinary Master of Arts in Bioethics with a thesis looking at the moral distress experienced by healthcare providers working with people who have swallowing problems. Dr Hannah Crawford is a Consultant Speech & Language Therapist and specializes in dysphagia in adults with learning disabilities. She is a professional advisor for the Royal College of Speech & Language Therapists. Hannah is co-lead for the Newcastle University Dysphagia CPD Masters module. She completed her PhD at the University of Edinburgh in 2016, investigating the lived experience of family carers of adults with profound and multiple disabilities and dysphagia. She is AHP and Learning Disability lead for research in her Trust. ...This short book is relevant for students and clinicians alike across a broad spectrum of clinical caseloads. It describes in detail the ethics around dysphagia management, including references to capacity and consent, and supports the reader to make person-centred decisions in conjunction with patients, family and/or caregivers. Each chapter contains useful definitions of concepts that are frequently used within various policies and literature surrounding the medical profession. The four case studies referred to throughout the book are all purposefully vague in order to guide the reader through general processes and considerations around psychosocial factors and quality of life. Through these case studies, the authors address several clinical scenarios that a dysphagia practitioner may regularly face, and discuss possible resolutions. The authors' extensive clinical experience has clearly guided the extracts, making them easy to relate to. Each chapter highlights considerations around eating and drinking and how these are perceived in the wider familial and social context. It provokes the reader to think about the situation from a patient and family point of view, and how this may differ depending on the individuals involved. Reading this text may give both new and experienced clinicians a new perspective on dysphagia management. ...The most wonderful book in the world.